"The design of the Crossroads Circle, like all other hardscape features in the Grove, was approved by the appropriate governing bodies, including the Recreation and Parks Department and the Boards of Supervisors of the City and County of San Francisco. The conceptual sketches included with your letter are just that. The actual blueprints and architectural designs that were approved clearly indicate three six-inch steps where the circle intersects the two trails leading to the Fern Grotto along either side of the Dry Creek." 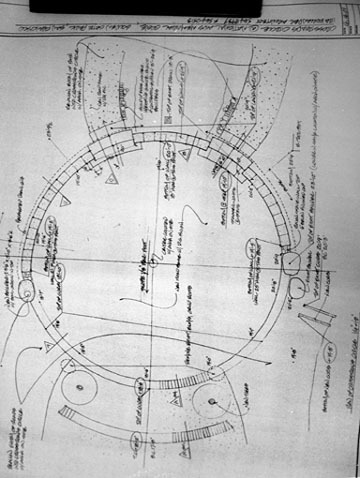 This is the sketch that the public was shown and accepted in 1998. This sketch is dated 4-16-01 years after any public review and acceptance. To date no one has been able to present sketches approved by any of the mentioned authorities, only these final drawings that don't even match the reality today. 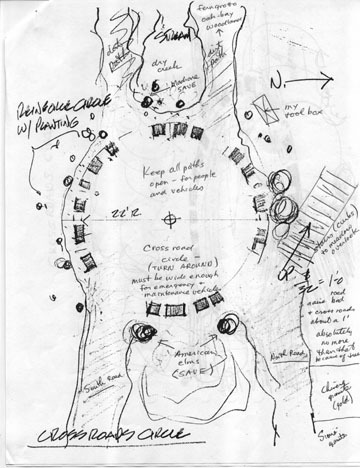 This sketch dated 4/16/01 clearly show removal of the two elms that as you yourself mention was NOT APPROVED.